People sometimes see squirrels with patches of missing fur and get concerned. Usually this condition is nothing to worry about. The fur loss can be the result of several conditions, including a harmless hereditary condition, though the most common reasons for fur loss in squirrels are mange and fungal infections. Notoedric mange, caused by a mite, causes large patches of fur to fall out and the skin becomes dark and thick. You may also see some scabs on the squirrel’s skin, because it scratches at itself to relieve the itching caused by the mites. Squirrels infected with mange often fully recover, although those with severe fur loss may not survive a cold winter. Notoedric mange can be transmitted from squirrel to squirrel, but other animals and people are not at risk. Skin fungal infections are responsible for most of the fur loss we see in squirrels. Squirrels with fungal infections typically have patches of fur that are much shorter than the rest of their fur. 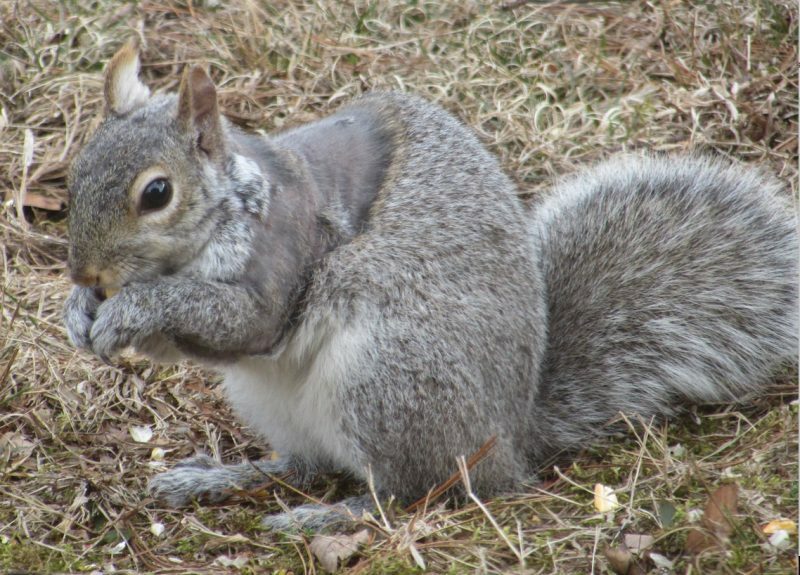 Most squirrels develop an immunity to this type of infection, and their fur eventually grows back normally. This condition is also not transmittable to people or pets.